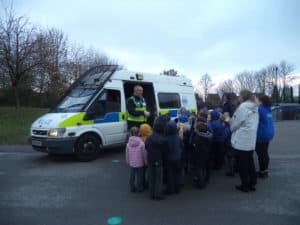 On 22nd November the school was visited by two local PCSO’s. 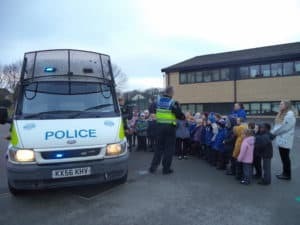 They did an assembly on road safety and how parents parking outside the school can be dangerous. Afterwards we got a tour of the police van, learning about why is painted the way it is, the equipment it carries and why there are different sirens. Mr Reed was then locked up in the back of the van, much to the children’s delight!